The campground / RV Park is in a treed park like setting. 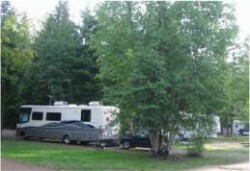 Our sites were designed to accommodate a variety of RV's, campers, trailers and tents. Free Internet, showers, pool, mini-golf.